That second refrigerator isn’t free. The electric company estimates that the old extra refrigerator costs more than $150 each year in energy costs. If you really can use it, okay. If not, get rid of the old beast and save your $150 per year. Do you really need me at $150 per year? 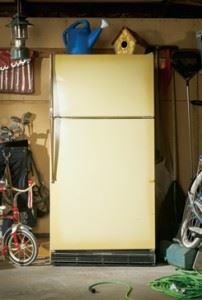 If you are buying a house and it has an extra refrigerator in the garage, you might want it removed by the seller. Remember, that old refrigerator isn’t free. If you are buying a new refrigerator and the store offers free haul away, seriously consider having them take the old one, even if it still works. Too many people fill up the garage with old appliances they really don’t need. If you want to get rid of a refrigerator, you have options. A lot of people call their local trash company to take away old refrigerators, and that may be the worst option. The trash company typically charges about $75, which seems like a good price. However, the trash company can only take curbside refrigerators. Therefore, you must haul that beast to the curb and they average 250 pounds. Moreover, the trash company requires that you certify that the Freon has been removed. You can get an appliance technician to come to your house and remove the Freon, but that service call costs about $180. Or, you can call Junk King. We remove standard refrigerators for $118, including all the labor, truck, recycling fee, and dumping fees. (If you want to put it curbside, we’ll match the trash company’s price and we’ll take care of the Freon.) Start saving money and energy today. This entry was posted in Debris Removal, Junk Hauling, Junk King Fairfax, Recycle and tagged Appliance removal, refrigerator on July 23, 2014 by Alex Powers. Last updated August 1, 2017 .